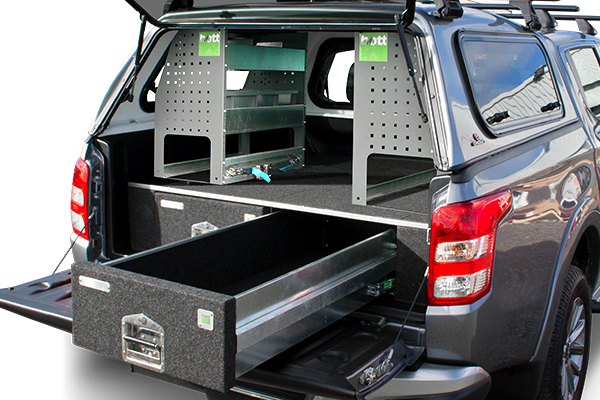 Drawers and shelving for utes from Bott are a refined storage solution that rethinks the quality of ute organisation. Built from steel and wrapped in automotive carpet, the dual drawers extend effortlessly along a rolling track, providing two heavy duty and lockable storage spaces, capable of holding 100kgs each. Made to sit above the inner wheel arch of the tray, the carpeted exterior of the drawer unit converts the tray into a clean, flat space with enough room below the top edge of the tray to offer generous room for immediate storage under a hard lid, tonneau or canopy. When fitting a canopy, one or two corrosion resistant steel shelves can be installed on top of the drawer unit. Built with two tiers, one holding plastic bins and the other adjustable dividers, all comfortably accessible through the lift up window of the canopy. • Clean automotive carpet exterior. • 100kg rated dual drawer system. • Hard wearing steel drawer and shelf construction. • Drawer dimensions: 1300mm x 430mm. • Plastic storage bin shelf: 320mm deep. • Adjustable divider shelf: 220mm deep. • Usable space: 1350mm x tray width. * Image includes optional Wing Kit and Shelving Units.